I have a new favorite dinner recipe! This dish meets every one of my criteria for an outstanding meal these days: easy, delicious, cheap, and toddler approved. Bonus points for using CSA produce (peppers for fajitas and avocados for guac). This dish is now officially in heavy rotation in our house! Don't be put off by the long list of seasoning ingredients; I had them all in my spice cupboard already and you probably do too! Thanks to my friend Carina for the recommendation. 1. Preheat the oven to 400 degrees. Mix all of the ingredients for the fajita seasoning in a small bowl and set aside (chili powder, paprika, onion powder, garlic powder, cumin, cayenne pepper, sugar, salt, and corn starch). 2. 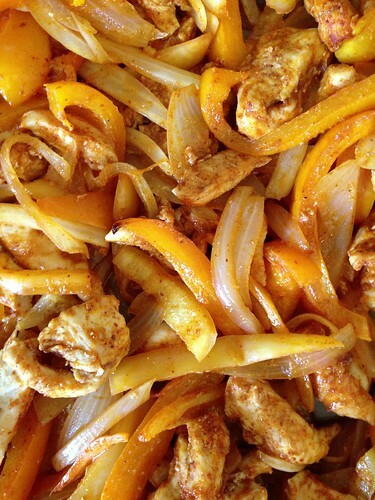 Cut the onion and bell peppers into ¼ to ½ inch wide strips. Place them in a large 9×13 inch casserole dish. Slice the chicken breast into very thin strips and add it to the casserole dish with the vegetables. 3. Sprinkle the seasoning over the meat and vegetables. Drizzle the vegetable oil over everything and then use your hands to toss the ingredients until everything is well coated in oil and seasoning. Bake in the preheated oven for 35-40 minutes, stirring once half way through. Squeeze the juice from half of the lime over top of the meat and vegetables after it comes out of the oven. 4. Scoop a small amount of meat and vegetables into the center of each tortilla. Serve with desired toppings.